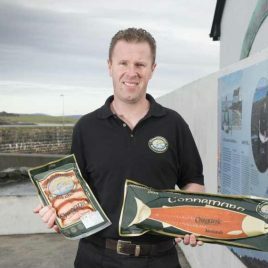 We invite you to visit the Connemara Smokehouse if you are ever in our part of the world, drop in and say hi. We also welcome Group Tours & School Groups all year round by appointment. In our Smokehouse Tour you will watch Graham or Nicolas hand fillet and traditionally prepare the salmon, explain the salting and smoking techniques, then show the hand slicing and packing of the finished product. You will enjoy a tasting of our fantastic smoked salmon. We are sure you will then want to buy some to take home, or to eat while you are here on holiday or to send to friends and family as a gift. It is fun, educational, and delicious.